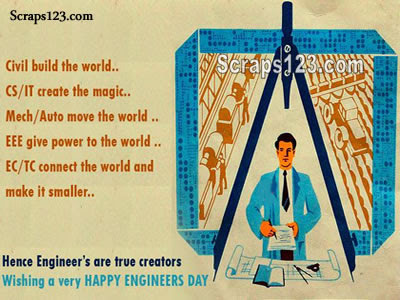 Happy Engineer's Day to all Engineers across the globe, we salute your great ideas and innovations that has truly changed our lives!! Engineering the art of organizing and directingmen and controlling the forces and materials of nature for the benefits of the human race. Hope we'll too soon become a successful and skilled engineer and make some of our contribution in the development process.